Over two thirds of American adults are classified as overweight or obese, according to the Centers for Disease Control. Weight loss is a major concern not just for appearance but for health and quality of life. 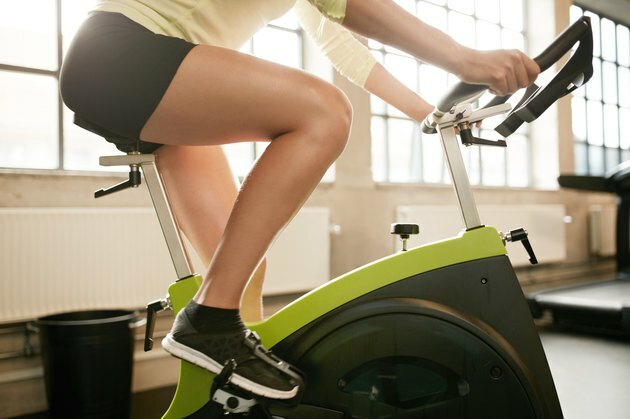 Riding five miles on your stationary bike can aid your weight loss if your frequency, intensity and duration fall within weight loss recommendations. Five miles on your bike can be easy or you can make it challenging by adjusting the resistance and pace that you pedal. Interval training on your bike will help you reach your goal of losing weight in time. You want to exercise at a moderate to high intensity at each session. This produces higher caloric burn and helps you reach your goals more quickly. However, don't jump right in to a hard workout. Start with light to moderate intensity and gradually increase so that your workouts become uncomfortable, but you are still able to continue. Ease back your intensity if you feel dizzy, light-headed or nauseous, or if you are recovering from an illness. The duration of your workouts is also important to weight loss. Depending on the person and the speed at which she pedals, five miles may take 20 minutes or one hour. For weight loss, you want your workout to last at least 30 to 60 minutes. This allows you to bring your heart rate up, keep it there and burn calories. It also has positive impacts on your health and function such as improving blood pressure and controlling blood sugar. If you are new to exercise, start slowly with only 15 to 20 minutes of exercise, whether this is one or five miles on the bike. Gradually increase the duration until you are in the recommended range. To produce significant weight loss, the Centers for Disease Control recommends at least 30 minutes of aerobic exercise five to seven days per week. You can choose to ride a stationary bike each time or do different activities. This frequency of exercise will help you burn calories to produce a negative caloric balance in your body. It will also improve your cardiovascular system so that activities of daily living are easier to perform. All the cardio in the world won't tip the scales enough, unless you adhere to a healthy, nutrient-dense diet, high in fiber, lean protein, complex carbohydrates and healthy fats. You can measure your caloric needs to a calorie estimates calculator like the one offered online by the American Council on Exercise. Plug in your data and your activity level and you'll have a guideline that will help you stick to a plan. Add strength training to your weekly workouts. Spend 20 to 30 minutes, at least two to three, non-consecutive days a week on lifting barbells, kettlebells, dumbbells or weight machines at the gym to build the muscle mass that will boost your metabolism. Do You Burn More Calories Running Than on a Bicycle? How Many Times Should I Exercise Per Week?